The perfect economical solution for all of your strapping needs. 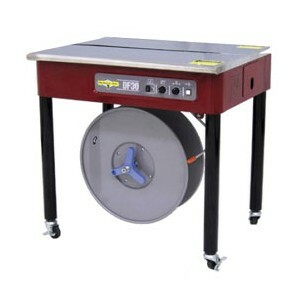 An economical, easy to use strapping machine designed to run 1/4 ”– 5/8” strapping. Equipped with externally adjustable strap feed and electronic tension control, the DF-30 is the perfect machine for securing and unitizing outgoing shipments. Offering added safety for the operator the DF30 has been redesigned with rounded corners, as well as an audible cycle alert safety signal. An "ACASS" is given when the strap has been inserted into the sealing mechanism prior to tensioning.